This post about Shiva as Gangadhara, Carrier of the Sacred River Ganga, is dedicated to all the keepers of the Star Lore, and especially to Stella Wheildon, guardian of Australian matristic lore. Her reference to the “two heavenly dogs [or dingos] who ‘guard’ the marriage cycle in the stars” reminded me of one of the places where in India the sacred secrets of our ancestors are hidden in plain sight. One of the beautiful images where cosmology, astronomy and spirituality synthesize into one is that of Lord Shiva carrying the celestial river Ganga on his head to facilitate her on her path down to earth, where she will nourish and purify humanity. It is a famous depiction of an even more famous myth. 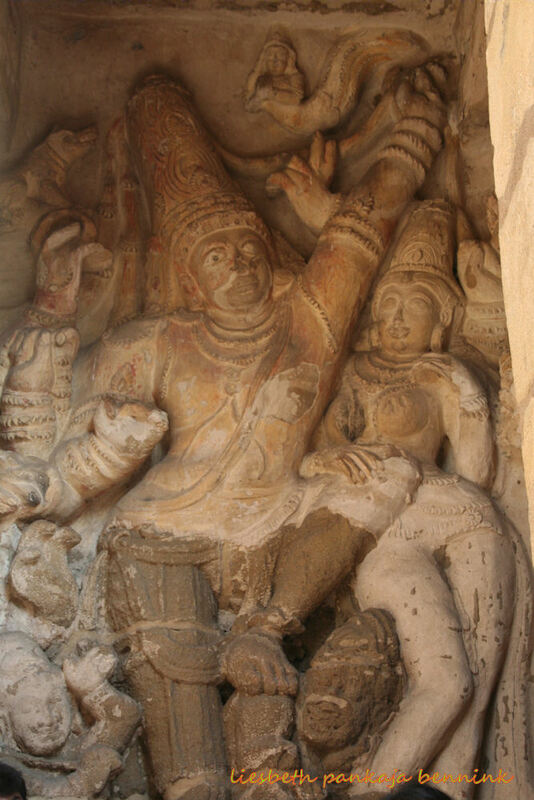 This relief is found in the central niche of the West facing wall of the Kailashanatha temple in Kanchipuram. The oldest structural stone temple in South India. Build between 685-705AD by a Rajasimha ruler of the Pallava Dynasty. 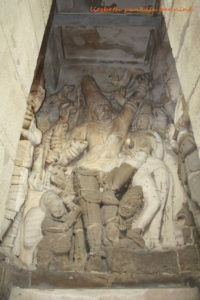 Shiva stands in a heroic pose, actively receiving Ganga in his hair with one of his 8 arms raised in a supportive and welcoming gesture. His left foot rests on the shoulder of a kneeling figure. His consort Parvati lovingly holds his raised knee, while standing somewhat bashfully on his left side. 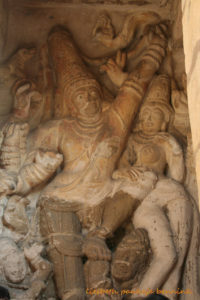 Ganga holds her hands in anjali, folded hands, offering her worship to Shiva. Her lower body flows as the river, behind Shiva’s head and down his right side. A chamara bearing dwarf, one of Shiva’s gana’s or companions, stands near his right side. Two dogs, one high up above Ganga’s stream, and one low on the right side, almost hidden in a corner, are framing this mythological scene. There are other depictions of the Gangadhara episode in which a dog is depicted. This is considered just another of those mysteries. But it actually is an essential part of the scene, and shows how knowledge is hidden in these ancient stories. Not hidden really, shown in plain sight, for all to see and understand. To us it is hidden and mysterious, because the meaning has been forgotten. Honestly also, I didn’t discover this. I learned long ago from an article by an Indian scholar. The story told by this relief is that of the Descent of Ganga, India’s sacred river, from the highest heaven down to earth. It is the climax of a long story which starts with Vishnu piercing the fabric of the universe with his big toe. When as Vamana, the Dwarf, Vishnu asked for ‘just’ three steps of land from the Asura king Bali, his first stride covered all of earth. His second stride crossed all of heaven and as the big toe of his left foot pierced the vault of heaven, the pure waters were released into our universe. Aeons later a powerful king named Sagara performed 99 Ashva Medha’s, Vedic Horse Sacrifices. When he undertook the 100th the god Indra hid the horse because Indra was famous for performing 100 Horse Sacrifices and he didn’t want to be matched by a human being. The king send his 60.000 sons to find the horse. They followed its trail to where a great sage, Kapila, was meditating. They concluded he must be the thief and disturbed his meditation. The heat of Kapila’s anger burned the 60.000 sons of king Sagar to ashes. They became roaming ghosts as no funerary rites were performed for them. Several generations of the king’s descendants tried to solve this for their dead relatives. One of them asked the sage Kapila what to do. He advised that the water of the heavenly river Ganga would purify the ashes of the 60.000 and would liberate their souls from their wandering. Again it took several generations before one Bhagiratha achieved this through spiritual dedication. As Ganga’s force would be unbearable to Earth, she was first received in Shiva’s hair, where she roamed till she could be received by Earth. Bhagiratha received her at the foot of the Himalaya and guided her from the mountain across the north Indian plains to where she joins the Ocean today. Finally she descended to the Underworld, where she purified the ashes of Sagara’s sons. Liberating the 60.000 souls. Ganga has purified and nourished all of India ever since. Every river and pond is part of Ganga. 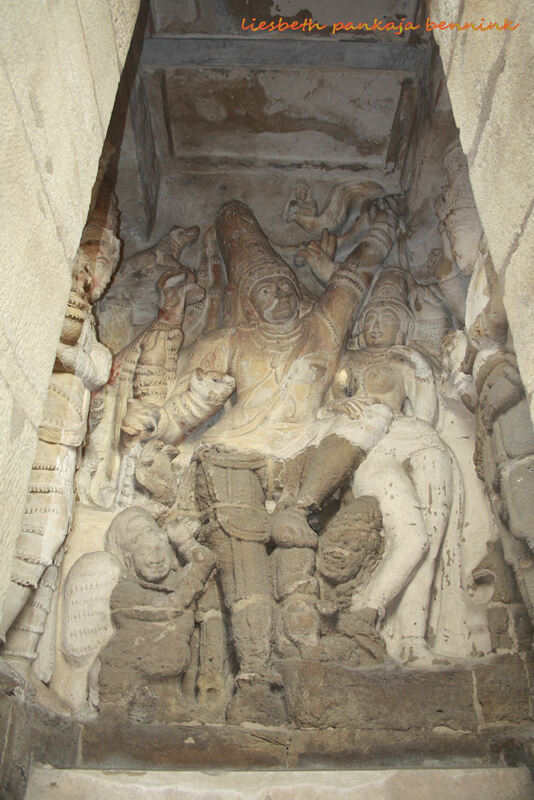 So in this beautiful panel of Gangadhara Siva in the Kailasanatha temple in Kanchipuram we see Shiva holding Ganga with two dogs being part of the action. These dogs have so far mystified many scholars. But when we realise the heavenly Ganga is the Milky Way it all becomes clear. It also means there are more mysterious ancient connections between the great civilisations of the world than realised by most. The Milky Way, the dogs and Orion. From Gangadhar [!] Tilak’s The Orion, opp. page 116. Modern astronomy basis itself on the Greek traditions. These in turn are thought by academic opinion to come from Babylon. Among all the constellations two are called Canis Major and Canis Minor. The Greater Dog and the Lesser Dog. These two constellations are found on either side of the Milky Way. The main star of Canis Major is Sirius. This is the brightest star in the sky at night. The main star of Canis Minor is the star Procyon. Procyon actually means the fore-dog in ancient Greek. Its name points to the fact that it rises before Sirius. 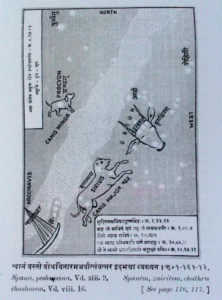 When we look at star maps we can see the position of the two dogs in the Gangadhara panel reflects the position of Canis Minor and Canis Major with respect to the Milky Way in the sky. Canis Minor is just to the North-West of the Milky Way. Canis Major, Sirius, is just under The Milky Way. 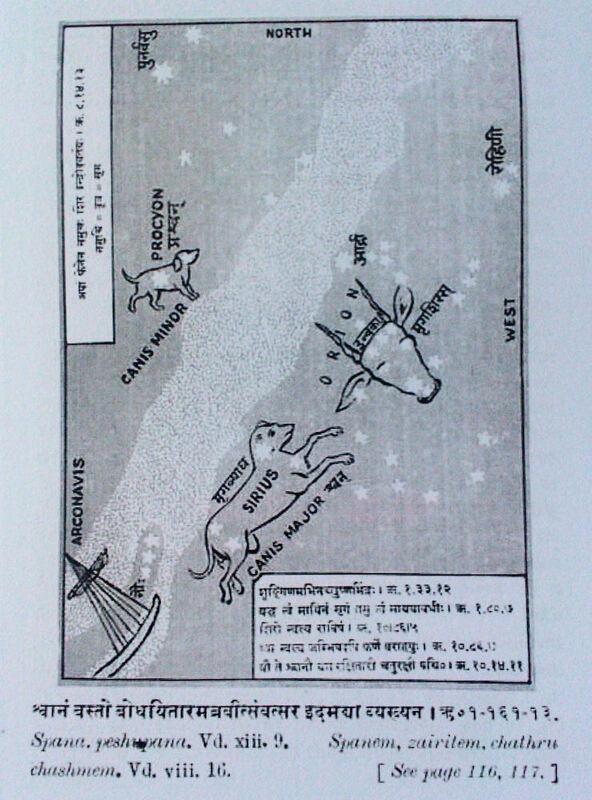 This identification shows Shiva is here situated in the place of Orion. In turn connecting to the identification of the Nataraja with the Orion. The myth of the Descent of Ganga connects spiritual truth with astronomical events and geographical and historical developments. Teaching humanity the interconnectedness of cosmic unfolding and earthly events. I will get back to this theme in future posts. Searching the puranas for clues I have not been able to find any references to the two dogs with respect to Ganga’s Descent. But there may have been alternative versions of this story that have been lost. Their prominent place in some of the Gangadhara depictions suggest as much. There are other myths in which two dogs play a role. The Rig Veda tells about the dog Sarama and her two children. These are the two messenger dogs of Yama called Shyama and Shabala that guard the way to his land. These myths connect and mirror the spiritual realm and the astronomical of the stars in heaven. Similar images and stories are found all over the world. See the itinerary and join us! The story of Gangadhara has much more to tell us. I will be sharing this with you soon. And we will be visiting the Kailasanatha temple in Kanchipuram as part of the Journey to the Center of your Self Tour in January (22 January till 1 February), organized by the Khemit School of Ancient Mysticism. 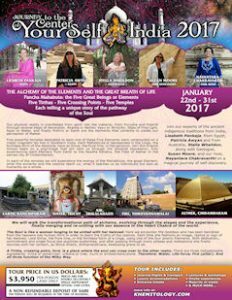 Together with Stella Wheildon and Patricia Awyan we will be experiencing the many Star Lore connections in the Indian traditions first hand! PS. This insight in the astronomical meaning of Gangadhara I came to know through and article by an Indian scholar. I haven’t been able to trace the reference but will share with you when I found it. It’s astonishing. Kindly provide us more knowledge. great text – well written, easy to understand, showing what has been overlooked and forgotten. many thanks! I have been giving ppt presentations on this for the past ten years. Ever since I met astrophysicist Dr. Nirupama Raghavan who was the Director of Nehru planetarium. She took me to Kailasanatha temple, told me the stories and shared her images of Nataraja and the Orion constellation before she succumbed to cancer. wow!wow! very nice to know! i will look at night sky with this new knowledge!